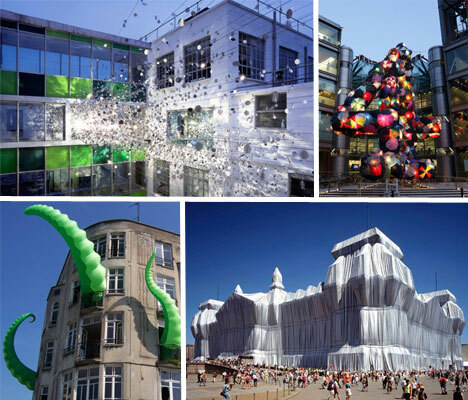 When does a building transform from a shell into a work of art within itself? Can artists improve even beautiful architectural wonders, turning them into something more creative and meaningful? Some architectural art installations are done out of necessity because the work is simply too large to be contained. 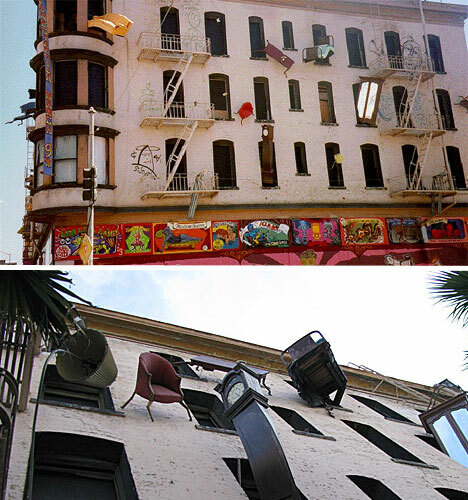 Others use the building to make a political statement, to give value to an abandoned space or simply for the pure joy of it. These 12 installations encompass the whole spectrum, making use of everything from the Sydney Opera House to a decaying factory. 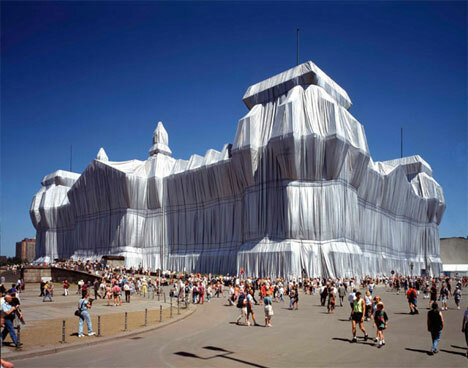 In 1995, artists Christo and Jeanne-Claude wrapped the entire Reichstag building in Germany with more than 100,000 meters of fireproof polypropylene fabric. The building, which housed the first parliament of the German Empire until it was severely damaged in 1933, had stood in ruins for decades and became a symbol for a divided Germany. The ‘Wrapped Reichstag’ installation was only up for two weeks, but drew five million visitors. Onlookers described it alternately as ethereal and graceful during the day, but ominous at night. Artist Stephanie Imbeau came up with a strikingly creative idea to win Channel 4’s BIG4 public art competition. Her entry, ‘Shelter’, was an installation that involved constructing blocks of illuminated discarded umbrellas. Though unconnected, when viewed from a certain angle the blocks appeared as the number ‘4’. 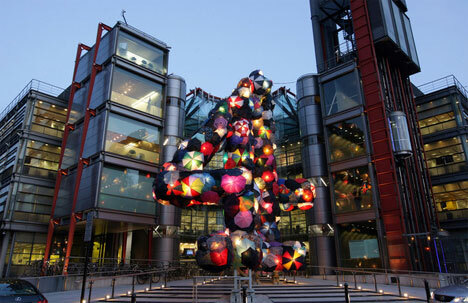 The installation stood in front of the Channel 4 building in London in March of 2009. 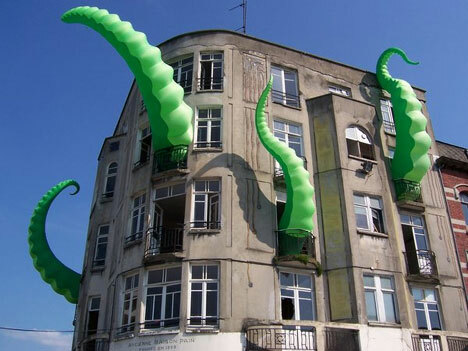 An artist calling himself ‘FilthyLuker’ installed inflatable octopus tentacles in the windows of an unnamed building in June of 2009, making it appear as if the building is being devoured by a bright green kraken that somehow emerged from the sea and got stuck inside. 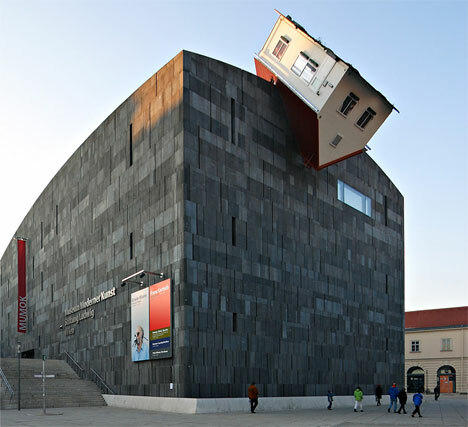 In 2006, artist Erwin Wurm had an art exhibit at Austria’s MUMOK (Museum Moderner Kunst), displaying work that was often architectural in nature such as ‘fat houses’. Outside the building, the theme continued with an installation called ‘House Attack’ – an actual house imbedded in the museum’s roof. 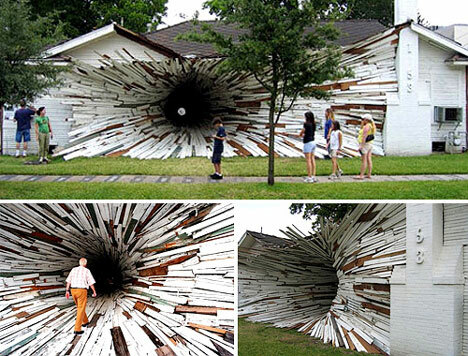 People passing by this building in Houston may have wondered whether it had suddenly turned into a black hole, or was the setting of some kind of explosion that defies the laws of physics. In fact, the strange tunnel was an art installation called ‘Inversion’ by Dan Havel and Dean Ruck, which was created just before the building was due to be torn down and replaced with a larger structure. The tunnel actually goes all the way through the building, ending in a private courtyard. 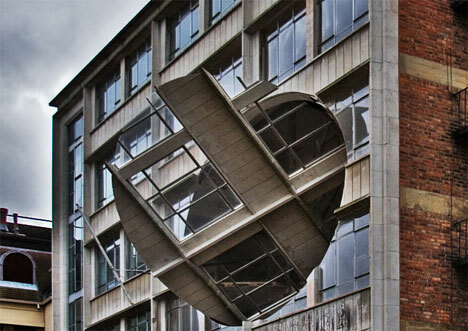 In Liverpool, a former Yates Wine Lodge building sat empty and decaying for years until Richard Wilson, one of Britain’s most renowned sculptures, decided to make use of it for a project called ‘Turning the Place Over’. Wilson turned it into a piece of public art, cutting an oval from the exterior on one side and making it oscillate in three dimensions within the cutout. The artist, whose work is often inspired by engineering and construction, used a giant rotator usually used in the shipping and nuclear industries to keep the façade revolving. “Light is only seen when reflected.” That is the observation that inspired an art installation called ‘Light’ by Studio ROSO for the Clarks Shoes headquarters in England. 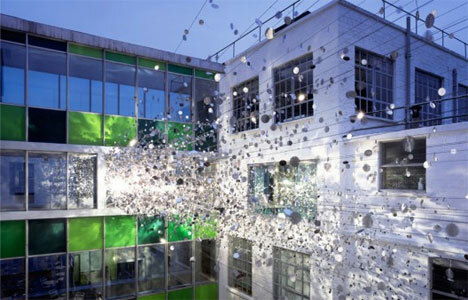 The work, situated in the communal courtyard in the center of the office building complex, consisted of mirrors strung from one end of the courtyard to the other. The strands of mirrors, organized into two ‘beams of light’, create a dynamic, ever-changing space as the wind and light changes throughout each day and as seasons pass. 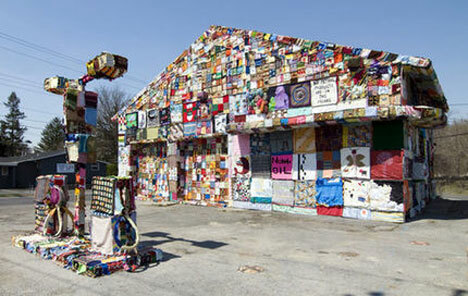 Jennifer Marsh, crochet artist and director of the International Fiber Collaborative, saw an ugly, abandoned gas station and realized she could use it as the setting of a unique art installation that calls attention to our dependence on oil. Soliciting 3×3 foot squares from fiber artists all over the world, Marsh covered the entire building, along with two gas pumps, with the donated crochet squares. To some people, this art installation is nothing but a bunch of stacked cast-off chairs. 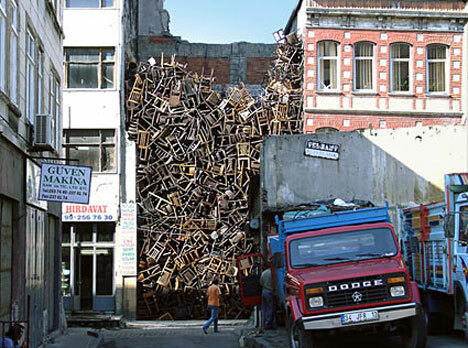 But to Doris Salcedo, each of the 1600 chairs precariously balanced upon each other between two buildings in Istanbul stands for a victim of mass violence in her home country of Colombia. Salcedo wanted to commemorate anonymous victims, portraying their loss through empty chairs in a visual that resembles a mass grave. 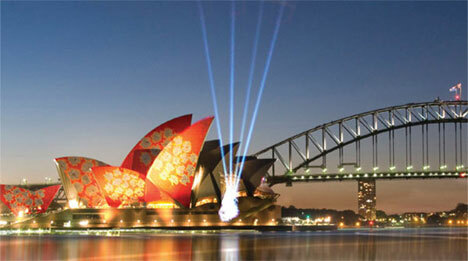 The installation was created for the 8th Instanbul Biennale in 2003. 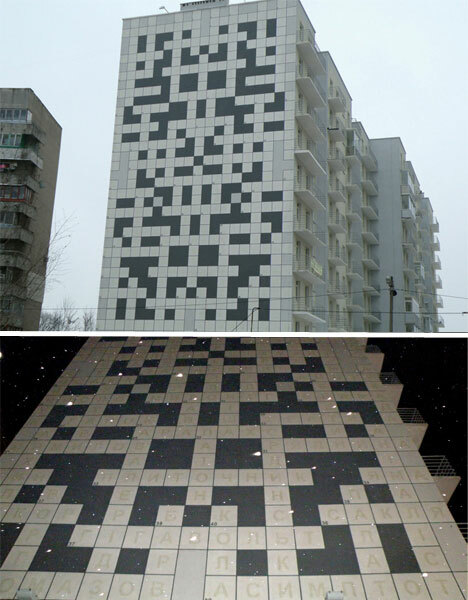 The city of Lvov in Ukraine decided to give tourists an interesting enticement to visit: a crossword puzzle on the side of an apartment building that is completed by finding questions at major points of interests all over town. Walking around the city, visitors collect questions at museums, monuments, theaters, fountains and other locations and write down their guesses. During the day, the crossword puzzle is empty, but at night, special lights reveal the answers.